LASIO® Professional Hair Care announces their participation at Brooklyn Fashion Weekend as the hair sponsor for celebrity stylist Iyana Winfield, lead hair stylist in LaureLuxe Metal Couture fashion show. Brooklyn Fashion Weekend, known as the “incubator” for emerging talent in fashion and design, solidifies Brooklyn as another hotspot in New York City filled with budding talented designers. This year, LASIO Professional Hair will be providing HYPERSILK styling products and LASIO ProStraight Flat Irons to help lead hair stylist Iyana Winfield achieve a sleek look to match the edgy appeal of the LaureLuxe Metal Couture line. Founded in 2000 as the brainchild of Nadine Ramos, LASIO® proudly holds the title of “keratin pioneer” in the United States due to Ms. Ramos’ recognition of the unique reparative characteristics of this naturally created miracle protein, in an industry previously saturated with Japanese straighteners and harsh relaxers. Since then, LASIO, Inc has begun to flourish into a beauty conglomerate; introducing the world to HYPERSILK®, a miraculous line of keratin infused daily hair care products, and Keratin Tropic®, the first formaldehyde free keratin treatment. LASIO continues to grow and excel as a brand committed to providing innovative products and tools for in salon services and at home use. Celebrity hair stylist, Iyana “Yani” Winfield, a New York native, has been making waves in the fashion and entertainment industry since 2007. Her unique sense of style, edgy appeal, and fearless risk taking has graced the covers of magazines, billboards, TV, and fashion runways across the country. 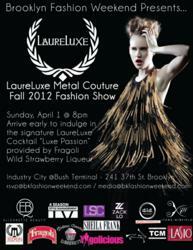 Edgy and unique, LaureLuxe Metal Couture and Jewelry puts a new spin on combining eco friendliness and fashion. It is for the trendsetter trying to deliver a message with their touch on fashion; anyone can wear LaureLuxe... it’s all about daring to be different.